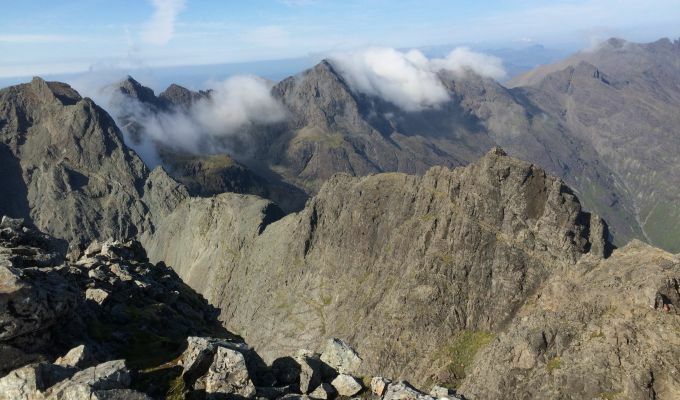 WHAT’S the connection between the Cuillin ridge and Poundland? Intrigued? Then just bear with me a minute. 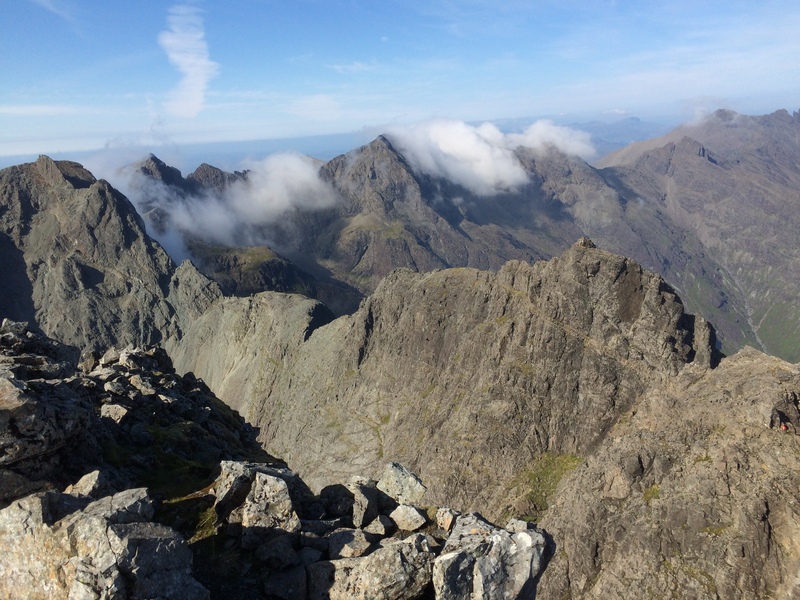 I was back in Skye trying to climb the five remaining Munros that would edge me closer to a third-round finish. Success would mean I would be left with one - Ben More on Mull - for another “compleation”. There were a couple of tricky ones in the mix. I was sure I could manage them by myself in dry, clear conditions, but unless you are a confident solo climber being up there alone can be intimidating. Route finding can be awkward and confusing. The weather was sunny, clear and breezy, but any sudden change can bring trouble down in a flash. There are a lot of people in a similar position so it’s often possible to “buddy up” for parts of the day, even just for spotting those invisible hand and footholds which were definitely there on the way up. My provisional programme altered almost right away when I managed to tag along with a guided party for the first day. This was a one-off but it got me up to speed again for some of the more intricate manoeuvres. Confidence is key in this playground of boulder chaos and hanging out for the day with Guy, a laid back rock tiger who has climbed the likes of the Eiger and the Matterhorn, gave me it in spades. Sgurr Dubh Mor is a seemingly solid vertical wall, breeched by a complex route on a series of switchbacks and ledges. Local knowledge is everything, far better than a game of vertiginous trial and error. It was the trickiest summit I had on my list. All the time the mist and cloud was swirling around the peaks organising a massive game of hide and seek, making these beautiful mountains seem even more mysterious and elusive. Sgurr Alasdair, the highest peak on the island, completed the round and then I wished Guy and my companions for the day good luck for the rest of their quest. I was now on my own. Next morning I pulled myself up through the sea of moving rock that covers the ever-narrowing passage up to An Dorus (The Door), a little nick in the skyline which provides access to my next two targets. The short scramble up to Sgurr a’ Mhadaidh and back down was simple, but the moves to get off the ground on its neighbour Sgurr a’ Ghreadaidh were a bit trickier. Coming back down here could prove more difficult. And this is where the buddy system worked a treat. When I reached the summit, there were three guys from the north of England sitting having lunch, contemplating their next move. There was also Neil, from Paisley. I had spoken to him earlier, and he was of similar mind about the downclimb so happy to share the burden. 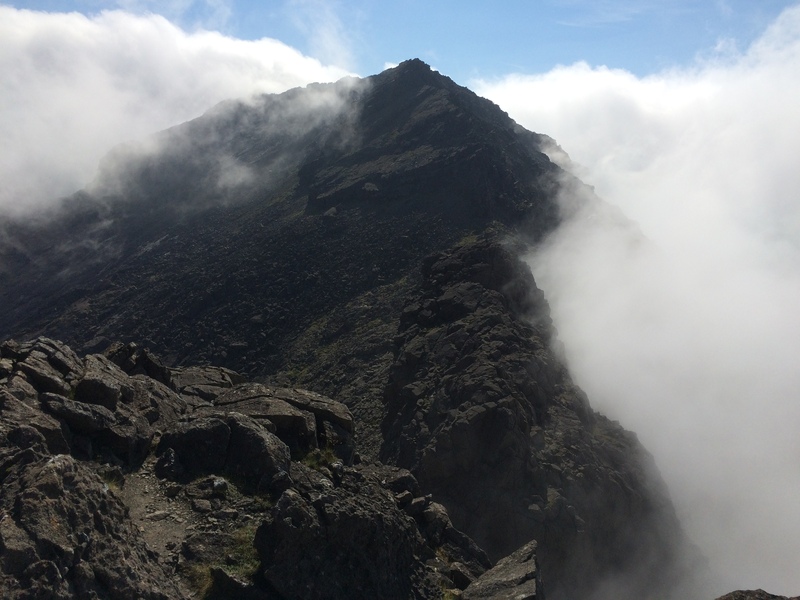 The route on to the next peak, Sgurr na Banachdich, is the narrowest part of the whole ridge. I have done it twice before, once in each direction, a teeter along a rock tightrope 3,000 feet above the ground. It’s heart-pounding, head-twisting fun but with the wind gusting at around 50mph, the thought of presenting myself as a kind of lightning rod for the thermals didn’t appeal. Even the guides were avoiding it, usually a good indicator you should follow suit. So the five of us started heading back down to An Dorus. One of the trio had a rope. When I say a rope, I mean a red, plastic-coated washing line. Yes, an actual plastic line for hanging out clothes. He had picked it up in a pound store. Why pay £70 for a climbing rope when you could get this for £1? It brought to mind the guy baulking at paying for a good parachute in the Volkswagen TV advert. There was a fleeting thought that it might just be handy for the short descent. Then everyone thought better of it and just shimmied down after a few moments’ consideration and shared encouragement. The man with the rope however used it for his descent, perfectly fine, probably even having the added bonus of getting his clothes aired as he flapped on the line. It gave an incredulous guide watching nearby a good laugh as well. A 6.30am start the following day had me up and down Sgurr na Banachdich by the simplest route in well under four hours, no heroics, no time-wasting, with the wind blasting across the slopes and the summit shrouded in cloud. That gave me a full house, five out of five, in my Skye chase. Now it’s on to Mull for a sunrise finish.